For the Xmas timeoff period I put on a large colonial bash, using a modified version of Field of Battles (PK Lite). The setting is NWFrontier, and I basically dug out every unit I can find and fit on the table and then concocted a story around it. We have about 25 units of natives vs slight lesser number of Imperial troops. 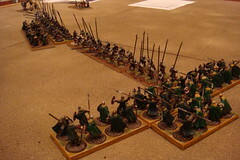 The situation shows a weakly held line of ridges in the center of the board defended by about 5 units of Pathans, and then advancing toward them are the advance guard of the British expedition who forced marched in order to capture the critical Height and have to leave their guns behind (main reason being that I can's locate my imperial artillery). On the Pathan side the reinforement have to enter from offboard. It's a classic "can the Brits force the position before it can be reinforced by crap load of natives" scenario. I tweaked the FOB rules by doing away with the initiative roll off and just combined two decks into one, so that every flip of the card the result could be either a British action of a Pathan action. Things are "mixed up" more and there is less of an issue with initiative run. The British decided to do a aggressive left flanking move to attack with the Mounted guides. It worked brilliantly and the Pathans looked like they might lose half of their position before their reinforcement even appeared on the board. Some solid defense by the Pathan in the center stablized the situation and then the reinforcement started to make a difference. 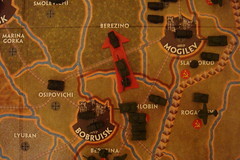 The game then became a series of desperate struggle that sees the initiative passing back and forth between both sides, with ultimate victory hanging in the balance. Due to the closeness the game went on longer than normal, and we did not call it until about 6 hours after we started it. The Pathans basically broke due to too much morale loss from the beginning, but it inflicted such losses on the British that it's best a Pyrrhic victory for the Brits. I started this year out working on maybe 4 different scales, but have finished the year solidly in the 15mm camp. Flames of War continues to grab our attention, even after flirting with some alternative rules sets (i.e. Blitzkrieg Commander, Rapid Fire! Disposable Heros among te major contenders we tried out this year). Even though FOW have its faults (just go to TMP and swing your arm with your eyes closed you are bound to hit a thread damning the system in one way or another), we've come to accept it for what it is: A well supported set of tactical rules that's fun to play and have enormous support in the hobby space, and the model are some of the best around. If you can support ASL, then supporting FOW shouldn't be that much of a stretch. Currently have finished forces of US mid/late war armored infantry, German mid/late war with a variety of big cats, and a Soviet tank hoard army. a DAK force is almost complete with some Br 8th army and Fallshirmjagers waiting in the wings. I have not completely given up 28mm WW2 skirmish. But my Ru and Fallshirmjagers is still waiting to get painted and unless something else gives, it's not likely to get done for a while. I still have Rules of Engagement I want to try out and some upcoming rules (the GW set rumored to be something different from 40k) might get these ahead in the painting queue. I now have a fulling painted Empire army (nicely done bought off eBay), a smaller half assed painted High Elf, and a horde of growing LOTR figures. The year started with some experimentation with rules like TSATF Fantasy (forgot the name), and also dabbled in PIQUET Fantasy (Hostile Realms). Both of them left me cold as confusingly written and a chore to play. Although I have not played the 800 lb gurilla here (WHFB), my taste tells me that it's probably too fiddley and micromanag-y for me. Out comes War of the Rings (WOTR). We have not been so excited about a set of fantasy rules (let a lone a set of GW Fantasy rules) in a long time. IMO one of the best thing they have done even accepting some of the complaint against it (some edge cases are not clearly explained, a FAQ is sorely needed). I now have a full Rohan and Mordor Orc army, with a growing Gondorian Presence. Definitely taken care of the early medieval/Fantasy niche I was craving for. Right now thinking about selling my WHFB armies (in addition to the two mentioned above, I also have an unpainted Orc/Goblin army box with rules. Continue reading "2009 The Year in Review"
Sorry about the paucity of updates. Work has been hell (you might've ready about the 17% blood letting at EA. I am ok thanks you, but needs to deal with the aftermath), and what little time I do have is spent actually playing, and not much painting. We've also dabbled in some Blitzkrieg Commander, but did not catch on (there are complaints about the excessive amount of dierolls). 2. 15mm Napoleonics: Sam Mustafa's Lasalle rules have just arrived and is the current Oh Shinny object at the moment. It has some influence from the best part of FOW (more on that later) and yet felt more historical. Thankfully our 15mm basing can easily adapt to the rules so some test drive will be done over the Xmas holidays. 3. 25mm Colonials: Busily mounting up painted Perry/Foundry Pathans and Sudan figures back from the painting service. Hopefully ready to see service by Xmas. Rules are probably gonna stick with Field of Battles (PK lite) but might give a spin with the new Black Powder set. That's it for now. Before the year's end the goal is to finish all my DAK, basing my Colonials, and finish my rangers. Each turn both players roll a die, and the total is the number of "moves" (or activations) for this turn. Each battle is diced between the two player and the higher player is the attacker, and can then place an attack arrow to generate a battle. First battle is a Sov attack, and I promptly launched into Berezino with an IS-2 and aome artillery vs Chris' single PzGren so I am counting on a victory (which will put the Ge forces next to Mogilev out of supply. The scenario generated is a Free for All game so each side will need a lot of platoons in order to hold and take ground. The way the game work is simple. each battle is an even battle (in our case a 1,500 pt game) where you can use any legal army list. Each "firestorm troop" you add (in my case the IS-2 and the arty) is on top of that, so I can build a list to complement the extra troops I am getting. First battle should be next week 7/28. Click through the picture to see more flaming tanks! Chris and I recaught the FOW bug (both of us have ADD when it comes to keeping a project on track), so I took a break from all the WOTR stuff and re-ignited my Soviet force (rounding it out with a few more T-34, built out my rockets battery, and started on some SMG infantry and some heavy stuff. 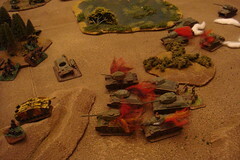 Recently battle have been various Ge forces taking on my Sov tank horde loaded up with tankoneski. Sov hordes are all or nothing army under the rules, we found that they roll over Ge Tank forces, but cheaper Ge grenadier co backed by a lot of AT weapons will easily take care of it. Click through for more pictures of our WOTR games. Other than Flames of War this is probably what I am playing the most (and by extension, painting the most). It has settled down into the default fantasy set for me for it is fast, deadly, and I liked the Rock Paper Scissor aspect of it. We are probably playing once a month or so, and we usually get enough people for a game of WOTR and one for the LOTR:SBG game as well (we are taking a break this month to play just a SBG game). Painting wise I have now amassed a truely large amount of unpainted lead/plastic that contains a full Rohan force (mostly painted), full Mordor force (mostly painted). Unpainted Gondor forces that's mostly regular foot and horse, with some Rangers and Army of the dead for color (led by Boromir and his bro). Besides that I have a smaller Easterling force (foot painted, horse still waiting for paint), and a none GW (Thunderbolt Mountain) Wood elves army superbly painted by Fernando Painting service (I sprang for the expansive paintjob since a Tom Meier figure deserves the best). 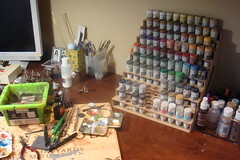 The new 100 bottle paint rack from Hydra Miniatures as it sits on my desk (the scary part is that I almost filled it the first go!). Painting wise just finished up some long dormant Soviet Tank riders for Flames of War. Next on the painting block is some odds and ends Soviet t-34 and the rest of the Ru Rocket troops. (on a Flames of War kick right now, enjoying the Operation Bagration releases).. Sorry about the lack of update. There's a very good reason for that: The new War of the Ring release from GW. I have spent most of my hobby time in the last 2 months either trolling trolling through eBay looking for figures, painting them, or working on building an army. The Rules are probably the best I've seen from GW (some called it what Warhammer Fantasy battle SHOULD be). The rules are more abstract than WHFB (you do not worry about strict movement paths and number of figures in a rank. Geometry is much less important which I feel is what make games like WHFB or DBx complicated. 1) Organization: Figures are organized into company (a stand) of 8 inf or 2 cav, and then company is organized into "Formations" (Units) of from 1 to 9 companies, depending on troop type. 2) Mechanics: Movement is very stylized. If you have enough distance you can move a company, exact how you get there is not important so this should speed up play and cut down on argument. 3) Fighting: Instead of rolling hit/kill/saves, the system gets converted into a single throw of massive number of dice. If you get offended throwing 40 dice in one combat then this is not a system for you. 4) Magic: A new spell system for GW that let you cast varaible number of spells with variable likelyhood of success. Some does not like the uncertainty but being a gamer who believe in Chaotic school of rules I like it. 5) Heoric Actions: A major theme of the game IMO. WHile rank and file troops can perform ordinary feats of arms, the game is won through using a hero's might at critical moments to achieve that special advantage. The amount of special actions has been greatly expanded to allow more interesting combos. A) Speed of play. The game moves fast. With when a charge goes off it's not surprising to see entire formation decimated. Definitely not a good set of rules to simulate attritional warfare, but makes for a good fantasy rules set with strong narrative. B) Modern Game play: Since the arrival of magic many game systems have a "combo" type of hook (Warmachine is the first thing that comes to mind). Now WOTR bring the same kinda of mechanism to Massed army games. While some may decry this as "cheese", what happens in WOTR are not really broken IMO so it gives it that extra tactical dimension of "getting your combo out". C) Cool Models: FOr once GW launches a new system and all 8 factions are more or less complete with figures (there are new stuff coming out of course but there's enough core troops to get started now). I've always liked the range but never really collected given that I am not a big fan of the SBG rules (I play for social reason since many in my gaming circle are fans). One additional good thing about the figs: They are relatively easy to paint given their muted palate so you can crank out an army pretty fast (I did 18 Riders of Rohan in 2 evenings, must be a record for me).